Pulmonary illnesses can cause structural damage within the respiratory tract that diminishes the efficacy of the natural defense mechanisms described previously and can change the normal flora in the respiratory tract such that more virulent pathogens can flourish. 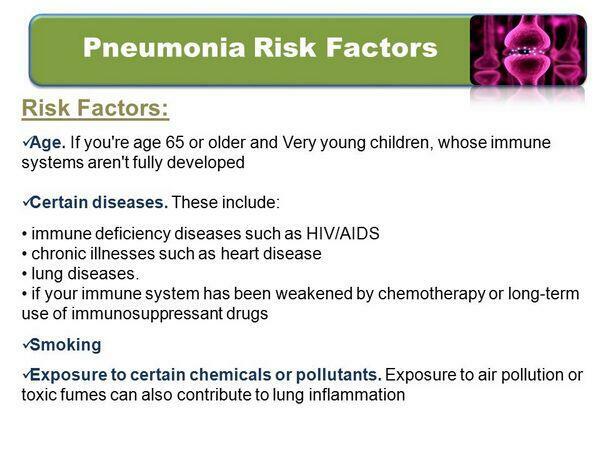 Several risk factors are associated with increasing susceptibility to pneumonia. Smoking increases the risk of acquiring pneumonia by destroying both the ciliated cells and alveoli. Similarly, viral infections can damage the ciliated epithelium and alveoli; therefore, prior and ongoing viral respiratory infections can predispose a person to bacterial pneumonia. Toxic fumes, industrial smoke, and other air pollutants may also damage cilia function. Certain comorbidities increase the likelihood of acquiring pneumonia by compromising the respiratory tract defense systems that prevent and fight infection. In addition to leaving hosts more susceptible to development of disease, these comorbidities are associated with progression to more severe disease. Alcoholics are at risk for developing pneumonia because while intoxicated, they have a decreased gag reflex, thus increasing the chance of aspi rating pathogens. Alcohol also weakens the immune response by restricting the mobilization of neutrophils. 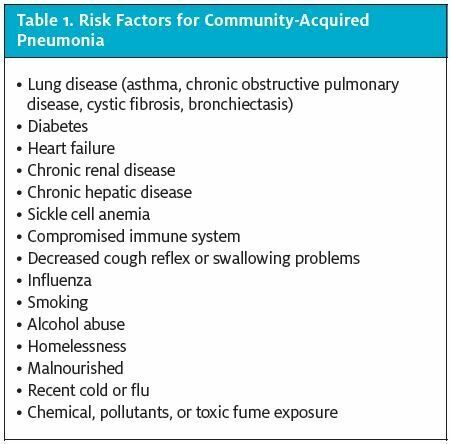 Consequently, community-acquired pneumonia in the chronic alcoholic is characterized by a more severe clinical course and higher mortality rate than community-acquired pneumonia in nonalcoholics. One of the subpopulations most susceptible to pneumonia is the elderly; their decreased cough reflex and weaker immune system can delay and disrupt the response to infection. Similarly, immunocompromised people, such as AIDS patients and patients without a spleen, frequently contract pneumonia. Because of their diminished ability to fight infections, these patients are susceptible to bacterial pathogens that would not cause disease in immunocompetent patients. Patients with chronic obstructive pulmonary disease commonly have infectious exacerbations that place them at risk for developing pneumonia. Penicillins, carbapenems, and cephalosporins (,6-lactams) Expression of ,6-lactamases (which hydrolyze ,6-lactam ring) is found in both gram-negative and gram-positive bacteria, and at least 340 ,6-lactamases have been described thus far. Sophisticated restructuring of the penicillin-binding proteins (PBPs) can result in penicillin resistance. Modifications in outer-membrane permeability can limit efficacy of the ,6-lactams. Macrolides and ketolides Alterations in the ribosomal binding site may be plasmid- or chromosomally mediated. Enzymatic modification of 50S ribosome target. Alterations in antibiotic transport (overexpression of efflux pumps) that expel antibiotics out of the bacterium. Production of enzymes that inactivate the antibiotic (e.g., hydrolysis by esterases) limits their efficacy. Decreased permeability limits the intracellular concentration. Fluoroquinolones Mutations in genes coding for DNA gyrase and/or DNA topoisomerase IV decrease susceptibility. Overexpression of efflux pumps expels fluoroquinolones from the bacterium. Tetracyclines Resistance to the tetracyclines can develop rapidly via the selection of isolates that lack permeability to the drug. Changes in the bacterial cell membrane that prevent accumulation of the drug within the cell (efflux). Production of enzymes that protect the ribosome complex limits efficacy of tetracyclines. Glycopeptides Modification of the D-alanyl-D-alanine components of the cell wall into D-alanyl-D-lactate components decreases susceptibility to glycopeptides. In children, the major risk factor for developing pneumonia is prior, usually viral infection of the upper respiratory tract. The tremendous increase in secretions, an increase in the density of colonizing bacteria, and impairment of the mucociliary apparatus lead to aspiration and pneumonia.